We are delighted to re-open our School Bank in association with Bank of Ireland Monasterevin. Our school bank team are Emily Carroll, Kellis Williams, Saoirse McConn, Jessica Smullen and Charmaine Okwutu. 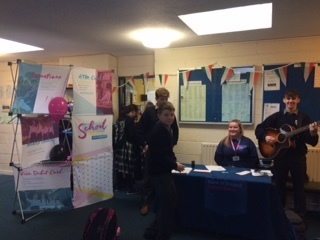 The re launch day was very successful with lots of first year students eager to set up an account and start saving. We were entertained on the opening day by Jack Treacy(5th yr) on guitar and Jamie Robinson(TY) giving us powerful renditions of ‘Picture This’. Why save in the school bank? Convenient- you can attend during school hours. Saving money regularly helps you in the future when applying for a loan. A minimum of €5 + online application form will be required to open a student account. Students will receive their bank card and PIN in the post. The school bank will be open on Tuesdays during lunchtime. Students can only lodge money into their accounts; they must use an ATM or visit a Bank of Ireland branch in order to withdraw funds.